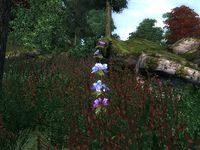 The ingredient Viper's Bugloss Leaves comes from the plant "Viper's Bugloss", which grows abundantly in the Great Forest region and can also be found throughout the West Weald region. Viper's Bugloss Leaves are one of only three ingredients which can be used to create a Cure Paralysis potion, although only at expert level. It can be combined with either Imp Gall or Milk Thistle Seeds. There are no negative side effects from combining any of these three ingredients.